The 48th Annual New England Music competition sponsored by the Accordion Teachers Association of Massachusetts (ATAM) featured the Showstoppers Reunion Accordion Orchestra on Sunday April 11, 2010. June 18, 2010 - Showstoppers Orchestra and Dancers will perform at Greeley Park outdoor stage, Concord St., Nashua, NH at 7:00PM. Open to the public. Lawn seating. 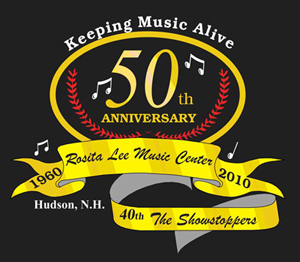 Rosita Lee and Roger Latulippe, the Showstoppers musical directors, have owned the Rosita Lee Music Studios since 1960. During the years, they have taught thousands of young people, providing them with wonderful opportunities to perform, travel, and meet all types of people because of having a musical ed ucation. The school originated with Mrs. Latulippes parents and the Rosita Lee name is her mothers name. The Showstoppers Accordion Orchestra was organiz ed in 1970. All three of the Latulippe children were members for many years. The group took top honors in many local, regional, and national competitions. Jody Latulippe , a graduate of the University of Missouri at Kansas City was an accordion performance major and is the owner of Lets Play Music Schools, NH. Their daughter, Holly Latulippe-Poitras won the AAA US Accordion Championship, concertized in Carnegie Hall as part of the AAAs series, and currently teaches accordion and performs. Shelly Latulippe-Klimas, studied accordion, voice and dance and operates the Rosita Lee Dance Center in Nashua , NH. Her dance troupe frequently appears with the Showstoppers Accordion Orchestra in addition to participating in dance competitions where they have won top awards. 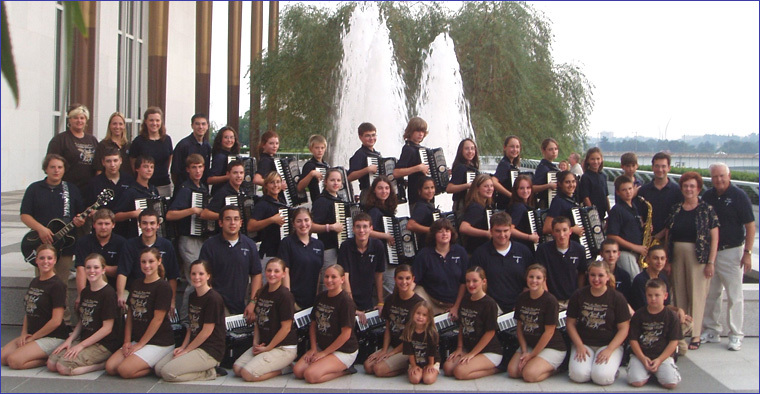 The Showstoppers Accordion Orchestra, well known entertainers in the New England area, has presented concerts in the USA, Italy, Ireland and Canada. They have been seen on national TV, in news articles, and performed with Myron Floren. Frequent participants in AAA Festivals, they performed six times in Disneyworld, toured Lake George, played at the Irish Festival in Massachusetts, appeared in Hershey Park, and performed at the Kennedy Centers Millennium Stage in Washington, DC during the 2008 Coupe Mondiale in the DC area. This performance is archived and can be seen on the Kennedy Centers web site. Copyright© 2010 Accordions Worldwide. All rights reserved.